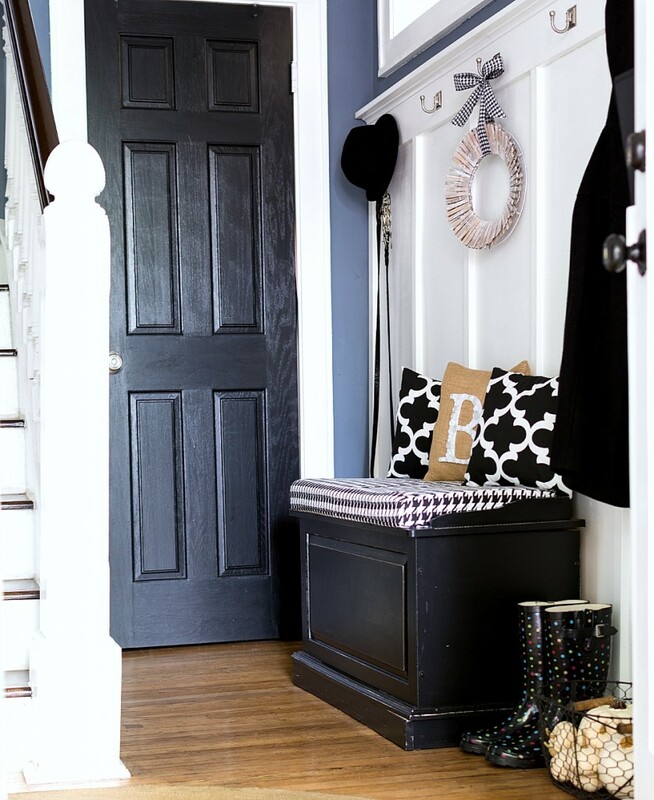 Fall decorating ideas in navy and brown. It took a long time this year for me to fully embrace summer. It was well into July before I shared my pasty white legs with the world, and that’s only because I was forced to. You just can’t wear long pants in Florida in July. Trust me, I tried. And it wasn’t pretty. Pasty white legs trumped dripping in sweat. Luckily I was in Florida. On vacation. And within days turned my pasty white self into bronzed and beautiful. Okay, maybe pink and tender at first. Which eventually turned bronze and beautiful. I sported shorts and flips flops with a sweatshirt. But I am sewing proficient(ish) and made some envelope pillow covers in brown and navy and blue and white ticking. I coupled those pillows with layered throws (you know, to keep my bronzed short-clad legs warm on those cool fall mornings). My daughter has staked her claim in that comfy corner of the couch and can frequently be found perched there with a cup of tea in hand and a laptop atop her lap. I’m just waiting for one of those twine wreaths to fall on her head. They’re only attached with some Command strips and Scotch tape. Tee hee. The simple (vignette-challenged) theme continues on the fantel mantel radiator cover. 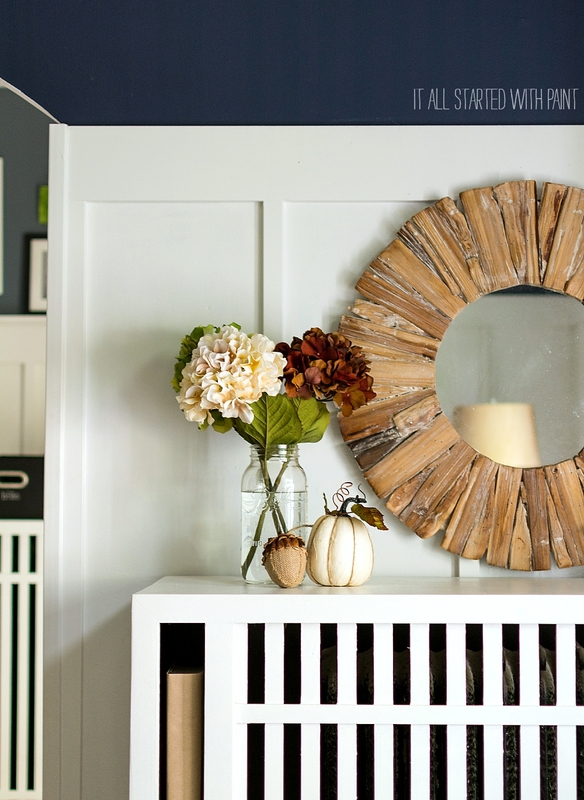 A new driftwood sunburst mirror (that, upon closer inspection, could use a shot of Windex …ah well.) 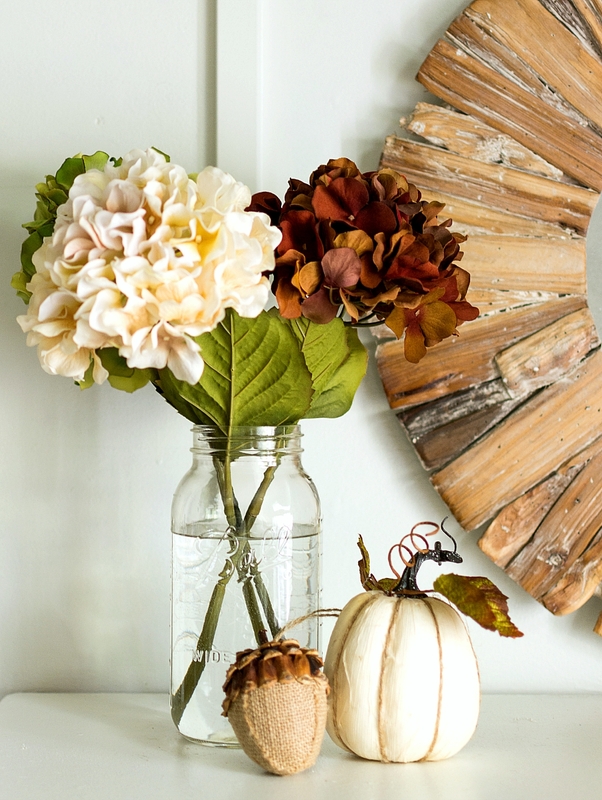 is anchored by mason jars, hydrangea and faux pumpkins and acorns I found at Michaels. 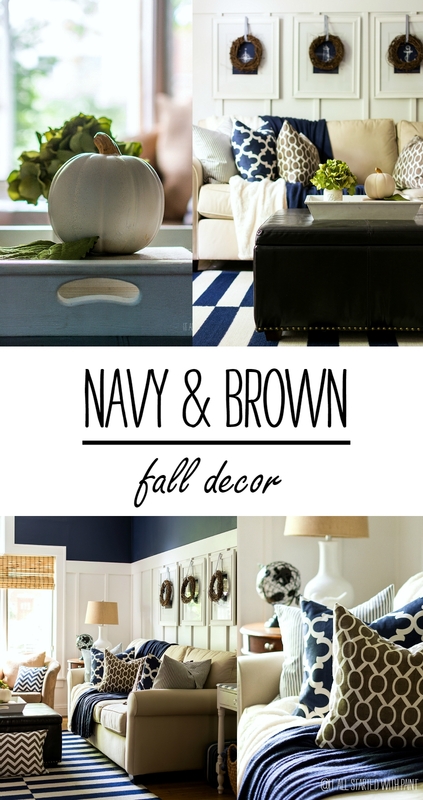 Thank you so much for stopping by and checking out my navy and brown fall decor in the living room. And while I didn’t share a picture of my fabulous bronzed short-clad legs, I can share some links to even more fabulous fall decorating inspiration. 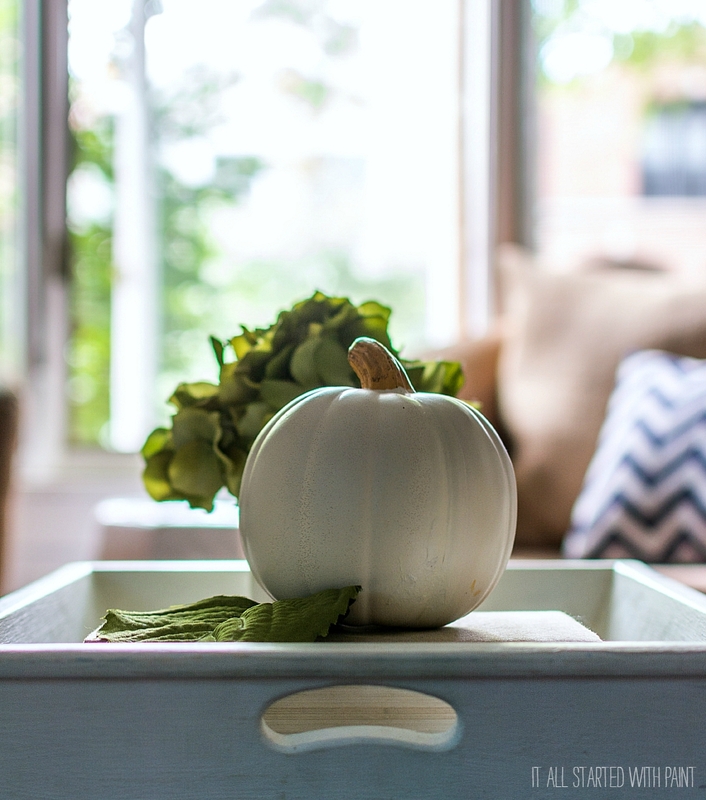 I’m proud to be part of a week-long fall decor home tour organized by Brenda at Cozy Little House (thanks Brenda for including me!). If you’re stopping by from Exquisitely Unremarkable, welcome to my home. 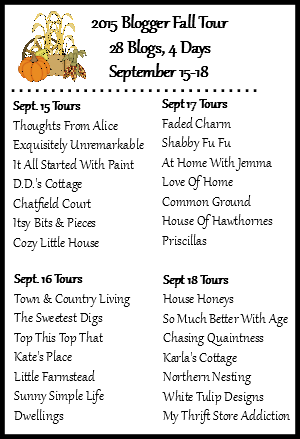 And next up for you is D.D.’s Cottage (which I guarantee you will love!). Now my shorts and my bronzed legs and I need to get busy decorating the rest of the house for fall. I so love how this room has so beautifully evolved and it looks fantastically Fall!!! i love the color combo with the splash of fall green! beautiful! Looks great, Linda! The navy is so fresh ~ enjoy! I’m a simple girl, too and I think your place looks just perfect for fall! Looks great! And fabulous photos. 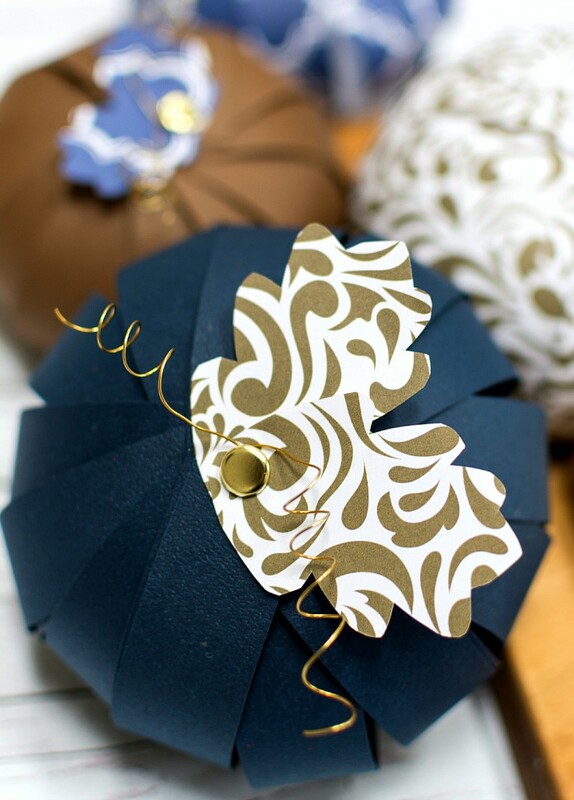 Beautiful fall touches, love the brown and navy! Everything looks lovely! I was supposed to do a tour, but it got cancelled, and I just stopped decorating. 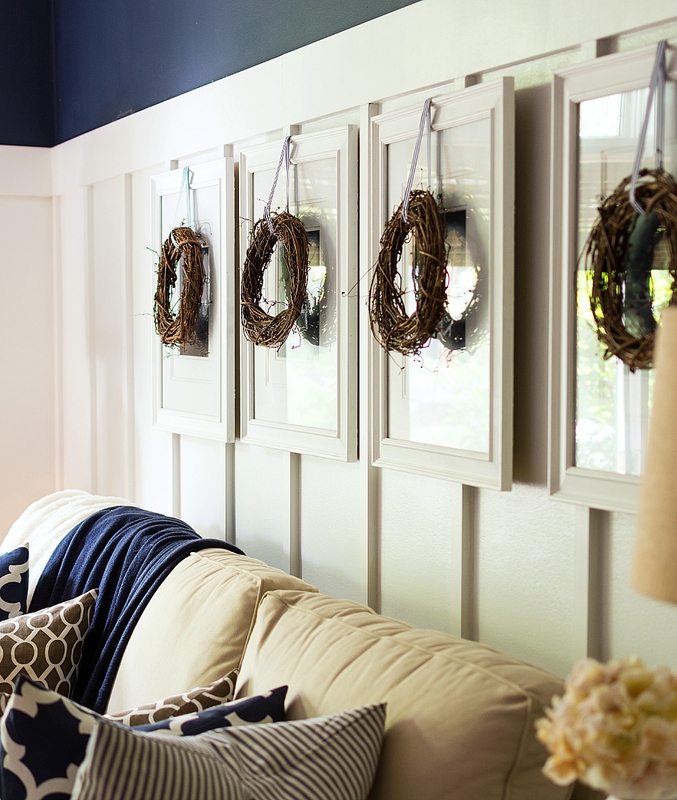 We have navy walls in our entryway but it has never crossed my mind to coordinate it with brown!! What a beautiful combination and just the kick start I need to transition into fall. Very lovely – thank you for sharing. your living room look just beautiful. I love all your fall touches. 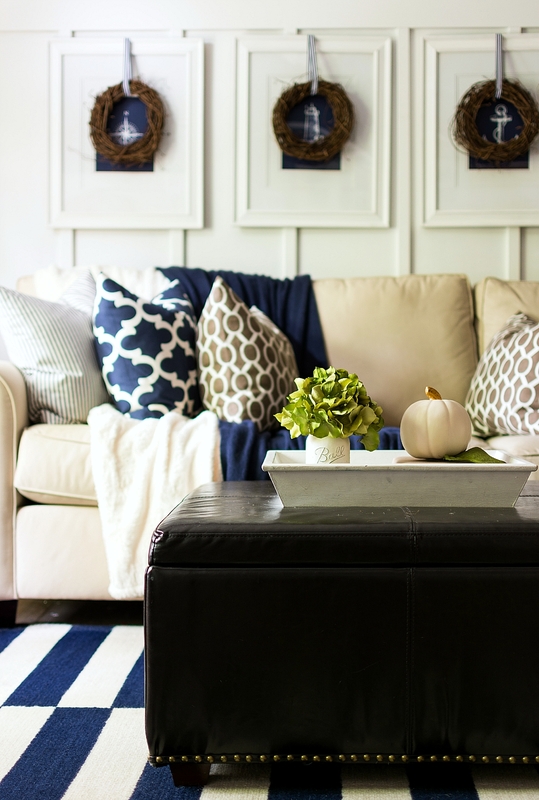 Love the color combo, the simple touches of fall, and all those pillows! So pretty! I created a Pinterest board today just for our tour. But I don’t see a Pin It Button on your photos! Guess I’ll have to figure a way to do it somehow. I have to dedicate a space to all this gorgeousness! Okay, found your Pin It Button and have pinned! I never thought of navy and brown for fall, but I do like it! 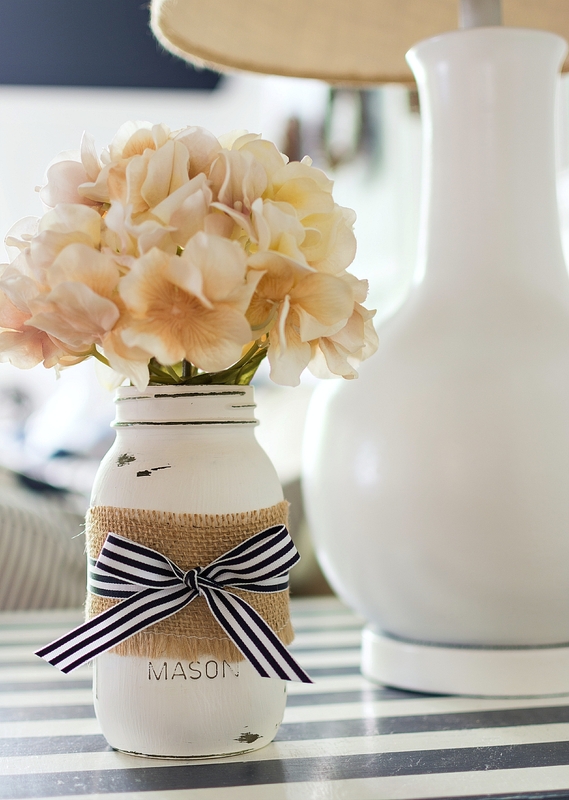 Love what you did with the Mason jar! It looks great Linda! 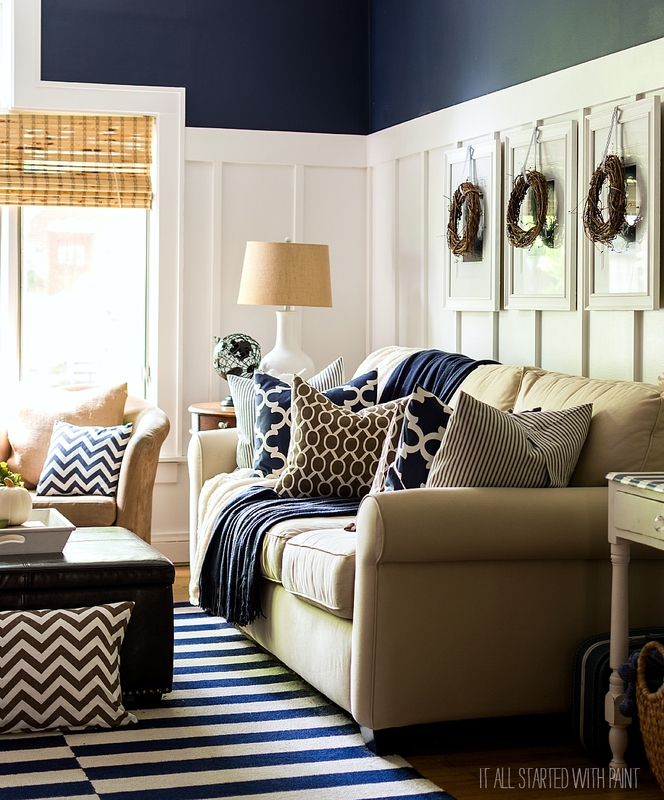 How are your navy and white rugs holding up? I’m not sure if my house is getting falled or not. Probably not. Maybe I’ll head straight to Christmas. This is so lovely! I love the navy/brown combination…it makes the green and bronze accents shine. It’s all so wonderful together! So pretty Linda, and I love the navy and brown combo you used. It looks like a very comfy room. Found you via the fall home tour. Love your use of navy, brown and white. Very fresh and modern. 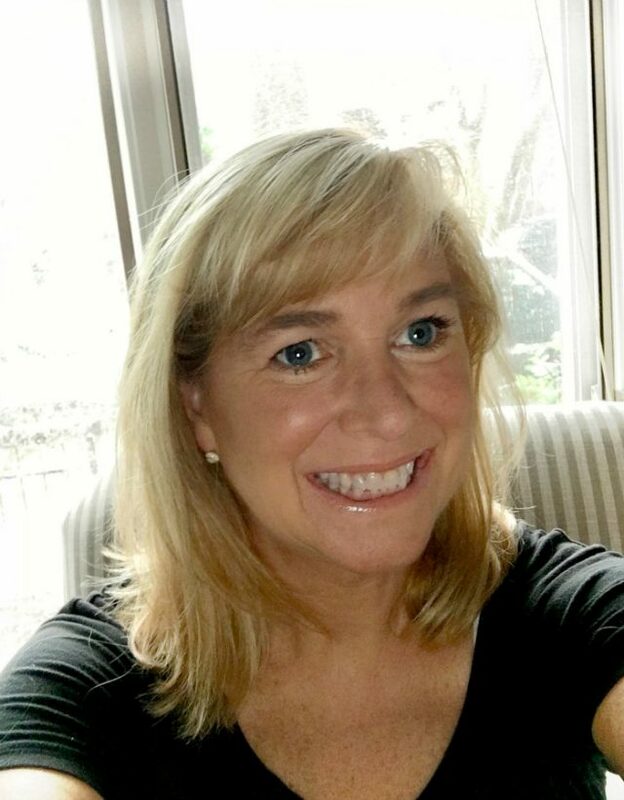 Hi Linda, what an amazing room, love the navy wall color and fabulous white paneling! 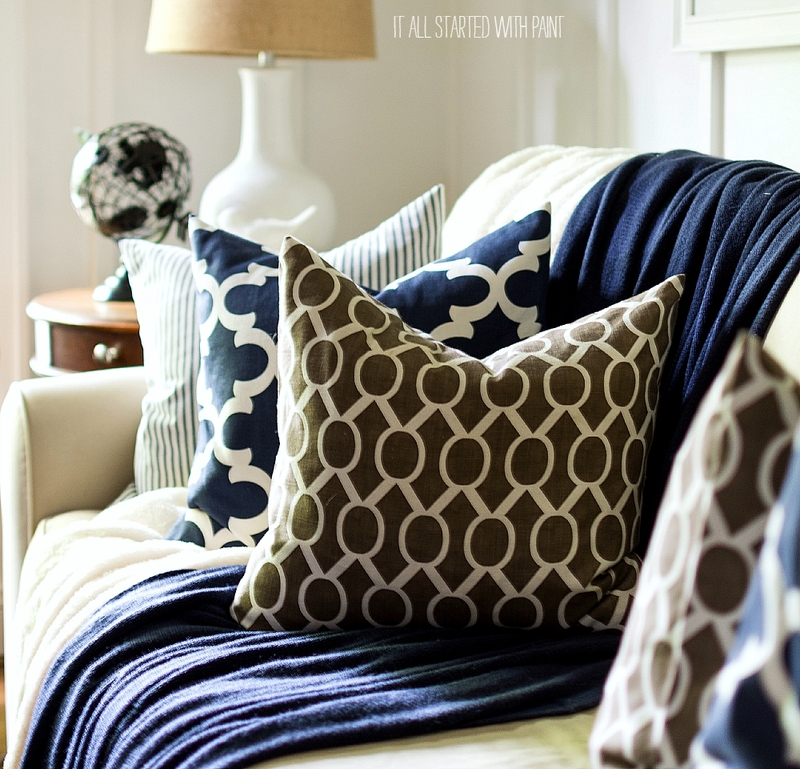 Love the navy and I haven’t been to your blog before so this was a visual treat! This was spectacular! Gorgeous combination of colors to bring in Fall. Beautiful home! 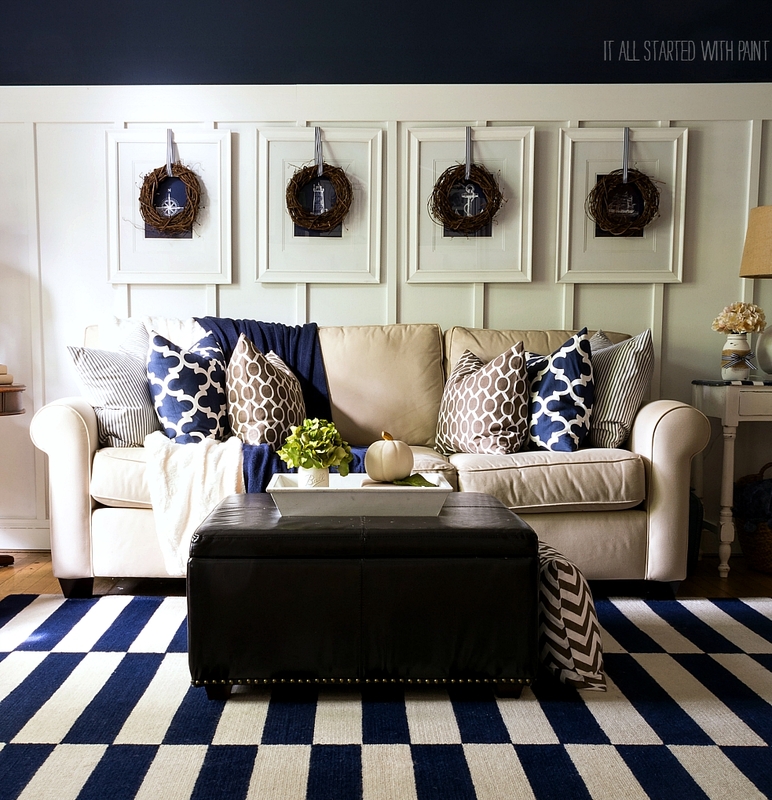 Beautiful blue and white walls! Your home looks very inviting with just the right amount of decor. As I looked at photos of my bedroom this week, I think the room looks too cluttered. 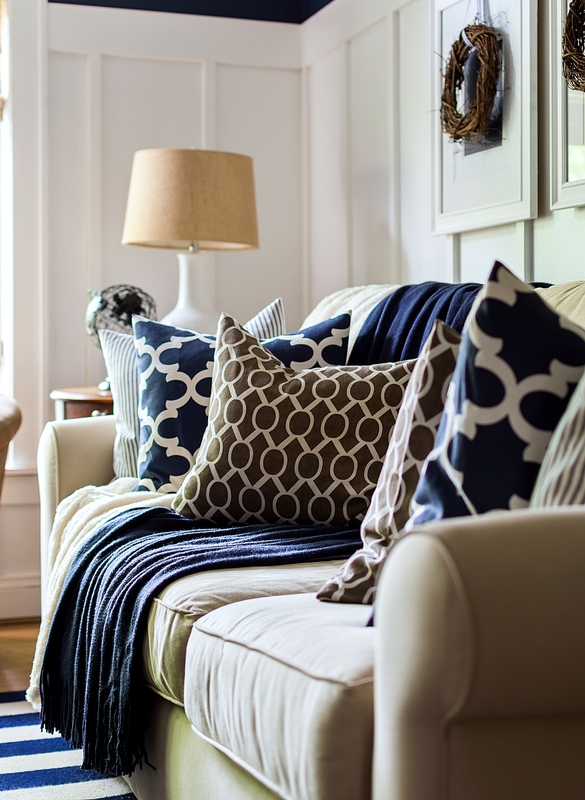 Your living room instead has just the right amount of layers for a cozy look. I, too, want a navy wall someplace in my house…. the utility room maybe? Great vignettes! I pinned the very first photo onto my Fall Pinterest board. If you’re vignette challenged, then I hate to say what I am (it wouldn’t be PC but I think you can guess). 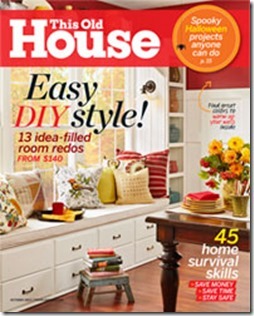 Love your wainscoting, and the combination of colors and patterns work so well together! Ohhh, that navy!! Everything is so perfectly put together but not overly formal. The perfect place to put up your feet with a cup of coffee. Gorgeous!! This room is gorgeous! I adore the neutrals and navy. Emily Henderson just featured the new Fall Target Collection and you nailed everything! Drooling! i think fall and your living room are bff’s. that color combo is amazing. I always see navy blue and white combination like a sailor theme. But what you did here – the brown- blue- white mix, is absolutely awesome and unique. All looks wonderful, but don’t get too used to the cool temps, I’m sending you another blast of humid. So tasteful and inviting!! It’s gorgeous. I love your home. Our den is in navy. The mason jar is so cute. Did you make it? Absolutely beautiful Fall decor. Love your color combinations! 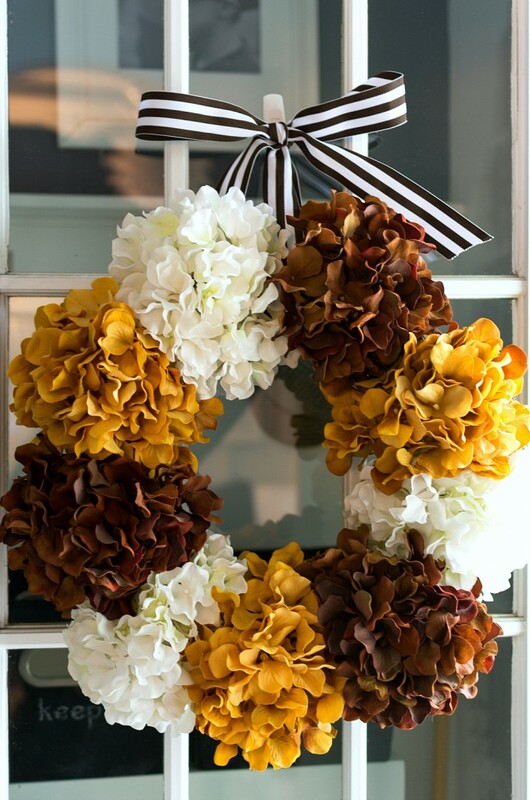 i hope you will share your fall decor at the Thursday Favorite Things Blog Hop! 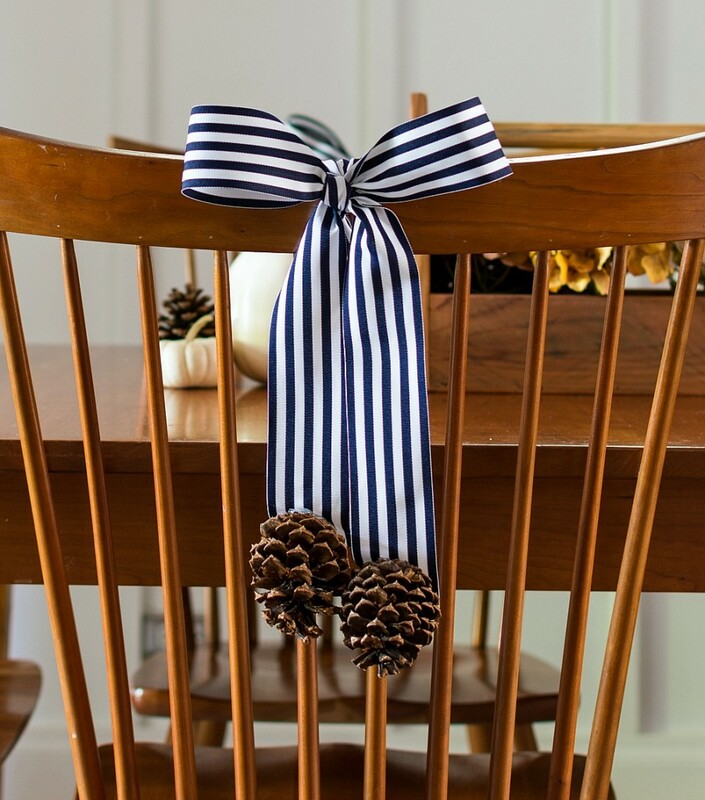 I just love how you used the navy in your Fall decorations…everything is just beautiful!!! Absolutely gorgeous. I am so inspired! 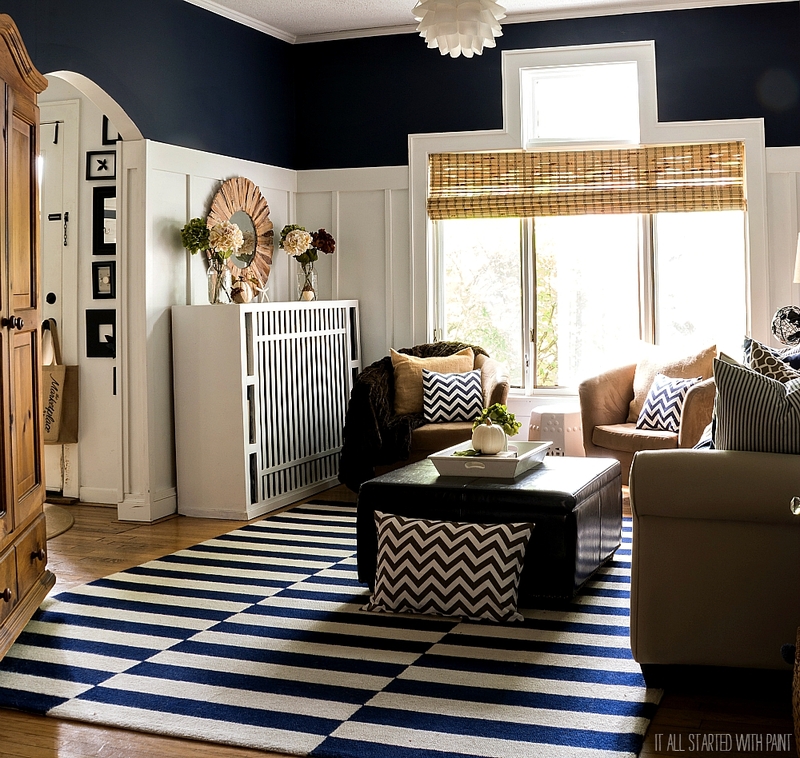 OH MY… I am in love with your navy and brown living room!! It is beautiful. 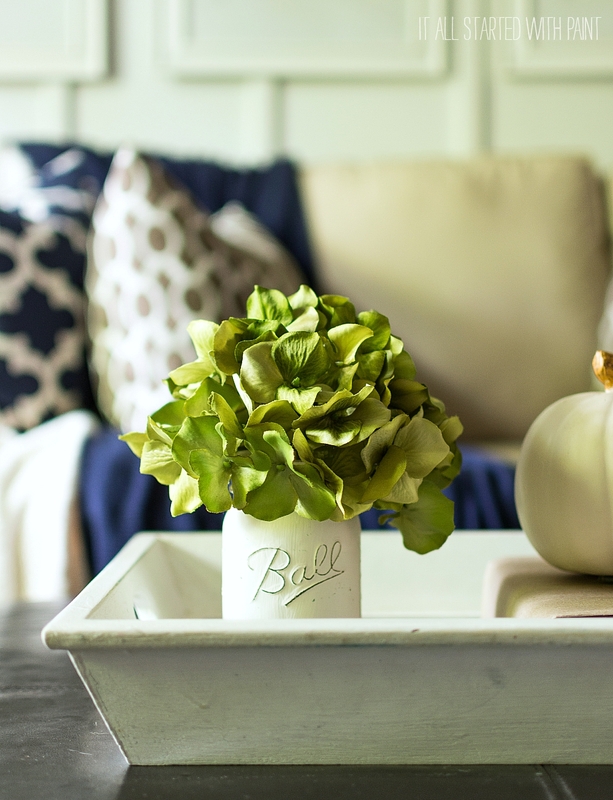 I love how you left a nautical touch to your fall décor. Thank you for the tour.. I am a HUGE fan!! I love the navy and brown together. It is a great color combination, and I love how it steps away from the “normal” fall like colors. Great job! Your living room is simply stunning. I absolutely love your living room. I’ll admit when I saw navy and brown I was a bit skeptical, but you’ve paired them together flawlessly. Your living room is so cozy! Thank you for sharing.